Heat oven to 350°F (325°F for dark or nonstick pan). Grease and flour 15x10x1-inch or 13x9-inch pan, or spray with baking spray with flour. In large bowl, gently mix dry cake mix, pie filling, eggs and chocolate chips with rubber spatula; break up any undissolved cake mix by pressing with spatula. Carefully spread in pan. Bake 15x10x1-inch pan 23 to 27 minutes, 13x9-inch pan 29 to 34 minutes, or until toothpick inserted in centre comes out clean. Cool completely, about 1 hour. Frost with frosting. For bars, cut into 8 rows by 6 rows. Store loosely covered. A dazzling drizzle of melted white chocolate makes these bars look even more special. 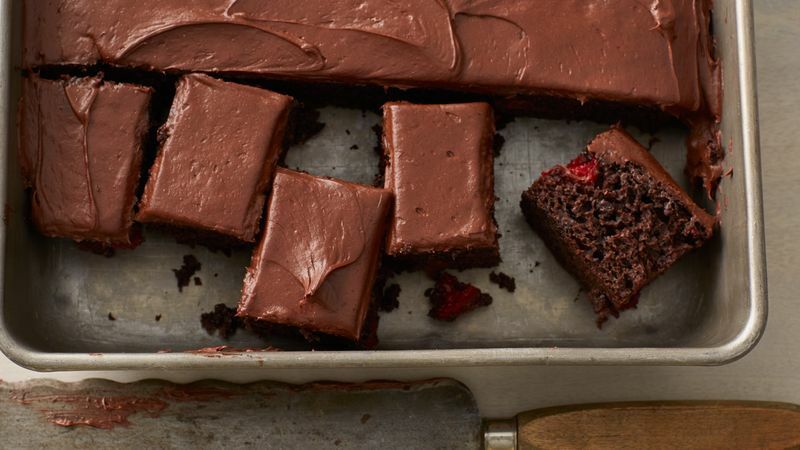 Make Triple-Chocolate Strawberry Bars by using strawberry pie filling instead of the cherry.